Why do I need a New York power of attorney? If you become ill or injured and you can’t take care of your own finances, someone else must step in to help. With a financial power of attorney, you name a trusted person to pay bills, make bank deposits, watch over investments, collect insurance or government benefits, and handle other money matters on your behalf. Without this important document, your loved ones will have to go to court to get authority over your financial affairs. In New York , the person you name to make decisions for you is called your agent. Any competent adult can serve as your agent; the person most definitely doesn’t have to be a lawyer. Honesty, common sense, and dependability should be the most important factors in your decision. It’s also wise to choose someone who lives nearby — this will make it easier to take care of practical tasks. In New York, you can draft your financial power of attorney so that it takes effect as soon as you sign it. You must specify that you want it to be “durable.” If you don’t, it will automatically end if you become incapacitated. 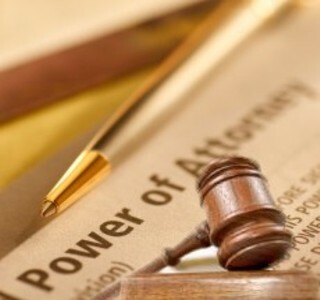 If you don’t want to make an immediately effective document, you can state that your power of attorney will not go into effect unless a doctor certifies that you have become incapacitated. This is called a “springing” durable power of attorney. You get a divorce. In New York , your durable power of attorney is not automatically terminated if your spouse is your agent and you get a divorce. As a practical matter, it is always wise to make a new power of attorney as soon as you file for divorce. No agent is available. To avoid this problem you can name an alternate agent in your document.